Approximately an hour and a half away from Cape Town is the seaside town of Hermanus. A popular holiday destination for tourists and locals alike, Hermanus is hailed as offering the best land based whale watching in the world. From May onwards Southern Right Whales pay homage to these warm, shallow waters in order to calf their young and to mate. The best time for whale watching is between August and November and at this time the bay is dotted with whales. More often than not, they're more than happy to put on a performance. Visitors keen to spot a whale or two need only walk along the cliff path that stetches for 12km from one end of the town to the other. Whales can be seen as close as 20 metres away frolicking in the sheltered bay or just beyond the breakers. The rumbling sound from the Whale Criers kelp horn signals to visitors as to where the whales can be spotted. Hermanus has a number of hotels, guesthouses and bed-and-breakfasts to offer as well as plenty of self-catering houses for rental. The town is generally busy during the holiday months of December and January as well as during the annual Whale Festival which takes place in late September each year. 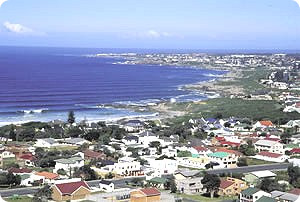 Hermanus also offers a few excellent beaches for both swimming and long beach walks, there are hikes and walks in the nearby mountains to enjoy and for the less energentic a good selection of art, craft and decor shops and plenty of restaurants and cafes to choose from for a leisurely lunch or breakfast. > Watch a video clip about boat based whale watching. 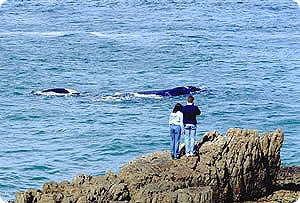 > Watch a video clip on land based whale watching in Hermanus. > Hermanus is easily accessible for a day trip and the scenic route via Gordon's Bay and Betty's Bay offers panoramic views across the bay towards the Cape Peninsula. > Alternatively, stay for a night or two and explore the surrounding area- for the adventurous why not try shark cage diving. > Other good whale watching spots are Arniston (about 3-hours from CT) as well as Betty's Bay. Whales can also be seen along the False Bay coastline.